Weather – Page 492 – Welcome to Wyandotte Daily! Cold temperatures continue Thursday, when the high will be 28, according to the National Weather Service. Single-digit wind chill values continued early Thursday morning and are expected Friday morning, as well. 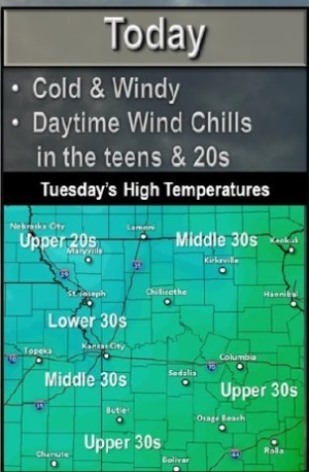 The wind chill climbed to 10 degrees at 8 a.m. Thursday. 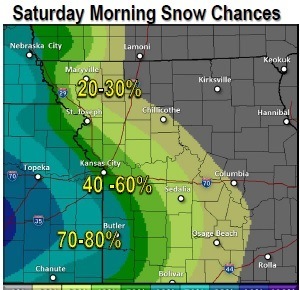 The first snow of the season is predicted to fall on Saturday, mostly after noon. There will be sunny skies and a northwest wind of 9 to 13 mph Thursday. Thursday night’s low will be around 13. Friday, look for mostly sunny skies, with a high near 32. Friday night, the low will be around 22. 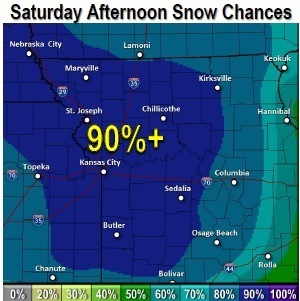 Saturday, there is an 80 percent chance of snow, mainly after noon. 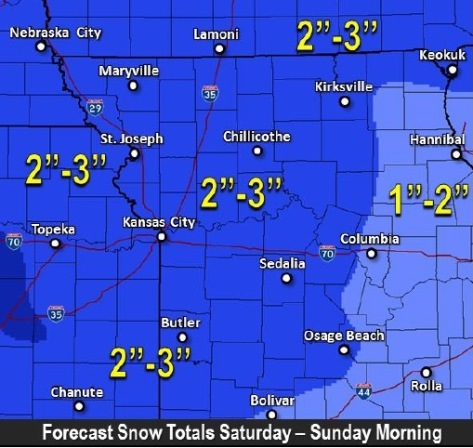 From 1 to 3 inches of snow are possible. The high will be near 30. The south southeast wind will be 5 to 9 mph. Saturday night, there is a 50 percent chance of snow, with a low of 19. Sunday, look for partly sunny skies and a high near 28. The low on Sunday night will be around 15. On Monday, there will be mostly sunny skies and the high will be near 27; the low on Monday night will be around 8. Tuesday’s forecast is mostly clear with a high near 27, and Tuesday night, the low will be around 16. On Wednesday, there will be sunny skies with a high near 37. Another chilly morning greeted residents today. The temperature at 8 a.m. was 22 degrees and at 9 a.m. it was 23 degrees in Kansas City, Kan. The wind chill was 11 degrees. Today’s high will be 29, with partly sunny skies. The wind will be north northwest at 13 to 15 mph with gusts up to 21. Tonight, the low will be around 18, and it will be windy, from 10 to 13 mph. Thursday, temperatures rise to 31 degrees with sunny skies and wind of 8 to 13 mph. Thursday night, the low will be around 16. 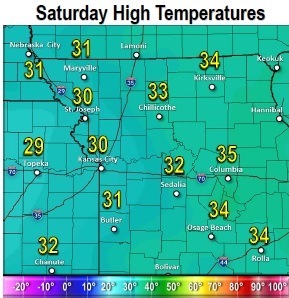 Friday, look for a high near 33. There will be mostly sunny skies with winds around 5 mph. 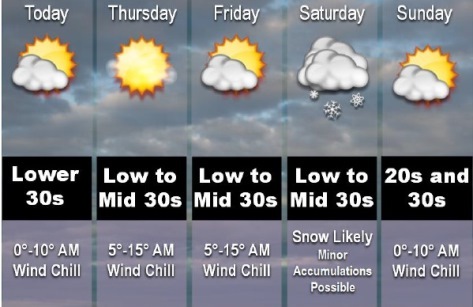 Saturday, there is a 60 percent chance of snow, with a high near 31. Saturday night, a 50 percent chance of snow continues and the low will be 19. Sunday, expect mostly sunny skies and a high near 28. Sunday night, the low will be 16. Monday, skies will be sunny with a high near 35. Monday night, the low will be 18. Tuesday, the high will reach 35. Some roadways in the region are considered slick this morning, according to the National Weather Service. Sleet and snow fell across the area overnight and melted quickly because of the warm pavement. Gusty northerly winds continue to usher in very cold air, as temperatures this morning are generally in the middle 20s to lower 30s. This steady stream of cold air could cause some roadways to become very slick especially elevated roadways, overpasses and bridges where warm ground temperatures fail to keep those roadways warm enough to prevent icing. The National Weather Service cautioned drivers to use extreme caution during the morning commute. Temperatures should rise back to near freezing by this afternoon, but only for a few hours before dropping back to below freezing for this evening. Wind chill values were in the single digits this morning, with values in the teens throughout the day. Single-digit wind chill values are likely again tonight. 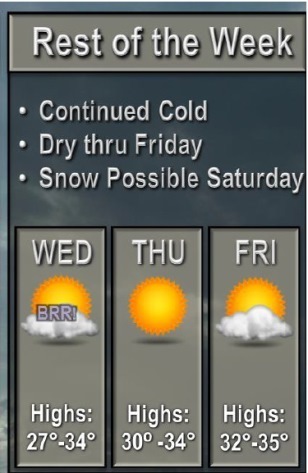 There is a chance for snow on Saturday. Light accumulations are possible at this time. Temperatures were 28 degrees at 8 a.m., and today’s high is predicted to be 32 degrees. Skies will be sunny. Winds will be 15 to 18 mph with gusts of 30 mph. Tonight, the low will be around 19, and a north northwest wind will be around 14 mph, with gusts of 21 mph. Wednesday, it will be partly sunny with a high near 29. The wind will be 11 to 14 mph, with gusts of 20 mph. Saturday and Saturday night, there is a 40 percent chance of rain and snow, and the high Saturday will be near 40 degrees in the day. The low Saturday night will be around 21.